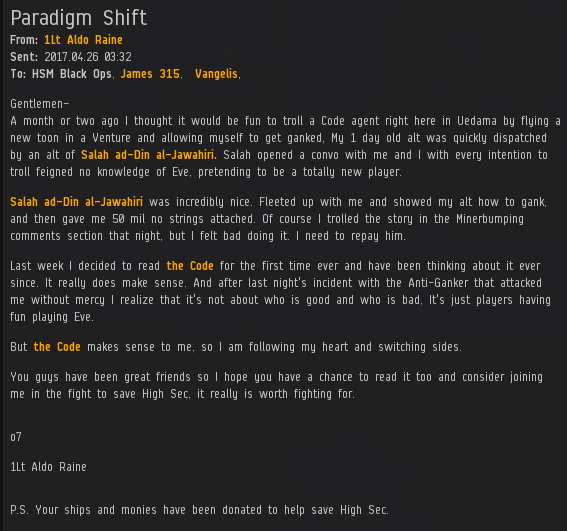 Feeling especially illumined after reading one of my old TMC pieces, Agent Viirilithizu Ward wrote an EVEmail and, though not mentioned in it, purchased 300 more shares of New Order stock. Our Agents win hearts and minds every day in highsec. Some of those hearts and minds belong to members of anti-Code organizations. The rebels say we drive away "newbros" from the game and threaten to destroy CCP's profits. Upon witnessing the truth for himself, 1Lt Aldo Raine gathered some of the assets of the "Highsec Militia" and switched sides. He also purchased 315 shares of New Order stock. But it was Prophetess Leroux who had the best timing this week. Her 200 additional shares sent us over the 1,173 billion isk mark and earned her a Supreme Protector's Tip of the Hat™. To all the anti-gankers out there, and especially to my friends. We all care about High Sec and we want to help the people in it. The New Order and AG just go about it in different ways. What I have learned, and what you guys already know in your hearts to be true, is that the Code the best way to go about it. It is certainly the most fun way (I do love explosions). What would high sec be without him? You need a permit to get the evemail to get the permit. 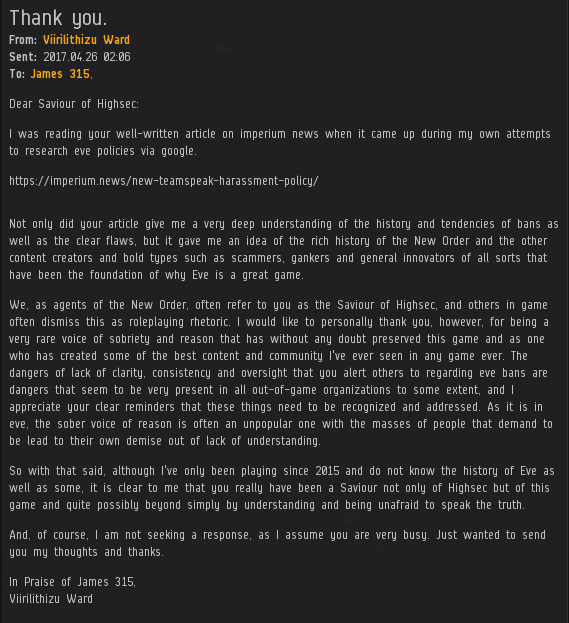 Its because evemail is not PvP.